The controls behind your AV system are crucial to its operation. A properly designed and programmed audio video control system will streamline the audio visual system operation. Combining many tasks into a few simple, intuitive buttons presses. Simplifying the process is the key to helping your staff be more effective and productive. At your command, the lights dim, the shades lower, the screen drops, the display comes to life. With one touch, you play a video and the sound is perfectly tuned to the acoustics of the room. You follow with a custom presentation complete with vivid graphics and remarkable imagery. Seamlessly you switch from your computer to your guest’s laptop and back, you are in control! As AV control systems have become more sophisticated it is important that your integrator understands every aspect of the integration. The various components - video, audio, network, and infrastructure all need to work together seamlessly. 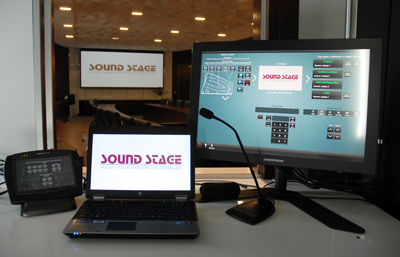 The Sound Stage staff, of trained and certified designers and programmers, is highly experienced, each having many years of industry experience.